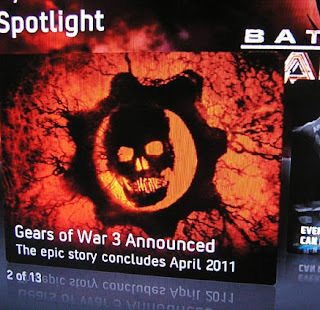 Home » epic games , gears of war , gears of war 3 , oops , video games » GEARS OF WAR 3: Video gaming's worst-kept secret EVER! GEARS OF WAR 3: Video gaming's worst-kept secret EVER! If you can't hear the hair-rending going on right now at Epic Games' studios in Cary not far away from here, I'd bet good money that Cliff Bleszinski's Twitter feed is about to go pure apoplectic. For more than a week Bleszinski - the creator of Epic's Gears of War series - had been hinting heavily that his appearance on Jimmy Fallon's show on NBC late night would herald the announcement of Gears of War 3. That was supposed to have been last night, but something got messed up behind the scenes and Bleszinski's appearance was postponed. Personally, I'd be sweating bullets right now. I mean, it can't possibly pay to honk off a man who's wedded a chainsaw to an assault rifle.